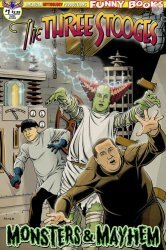 The Three Stooges Monsters & Mayhem - Choice of 3 comic covers - JUST IN! MyMovieMonsters.com > Comics - Archive Books > The Three Stooges > The Three Stooges Monsters & Mayhem - Choice of 3 comic covers - JUST IN! The Boys are back with brand-new classic Three Stooges madness and for a final trip to Castle FrankenStooge. This is Monsters & Mayhem #1. Choose from three different covers while supplies last! Completing the trilogy of classic horror movie inspired specials, the FrankenStooge Monster faces the most terrifying creature yet ... the WereStooge! You'll be screaming for "Moe" as you enjoy slaps, pokes, and hair pulling laughs from America's favorite funnymen. - and a special 350-copy Limited-Edition B&W Photo cover (this version has a higher cover price). Important Note: You must choose your desired cover at the drop-down menu above. If you wish to collect more than one, or all three, return to this listing from the shopping cart. We also offer The Curse of FrankenStooge #1 in three different covers while supplies last.